Here is another module called Financial Report. This is to give your pilots statistics of your airline as well their own. That's pretty sweet man. Nicely done. Thanks for the great add-on!!! i just installed everything on my phpvms 5.5.2. Its working but i get a error.. do you have any clue? 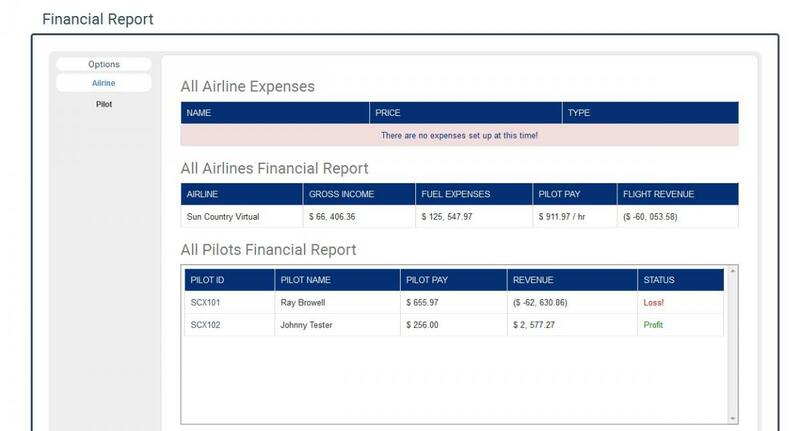 i attached also a screenshot..
Ok the verdict is in, it is because we have no airport expenses setup in the admin panel of phpVMS. Once you add a expense, that error will go away. It needs a if statement or something added like if no expense then echo message. that would fix it right up. Nice little module. I like it. I'll make the change. Thanks for the tip. Oh yeah any time man. I hope it works out. I like this module. I added soem expenses to my test airline today and all is well. It is functional and clean. I changed the code a bit to reflect a message instead of an error when there are no expenses added to the airline. Now we get a nice message that there are no expenses setup at this time instead of a error on the page. I am more than sure this will work for an airline that has only one pilot in the setup process that has no flights yet. I am going to go look at it now as we speak and see what happens. Thanks again for another great module Parkho. I like it. I appreciate the share with us. Here is mine skinned with the error gone and a message given. Thanks for the addition. Glad you like it. I have made changes in "airline_finance.php" as per TAV1702 mentioned. Just download and replace the mentioned file at GitHub. how can i fix them? like make them full screen. thanks. There is not for phpvms 5.3? Sorry! This add-on is only available for 5.5x by Simpilot. thanks again for another wonderfull module. currently the css is not working..
https://www.oneengineout.com/index.php/finance any idea how i can make it looking like yours? i added the link in toppilots as written in the readme of its module. but which link i need to add? Thanks for this mod. Quick question. For the expenses, everything is setup as currency. What do I change to make "Percent (Flight)/(Month" as a % not currency. Sorry man. Not a coder here. However i am not sure how to remove the "£" on my page or change it to "%"